Want to guarantee profits from the 2nd/3rd Horse Racing refunds? This guide will show you exactly how to do so. Regardless of where your Horse finishes, you will profit. Use the Matcha and the calculator below to highlight the best opportunities. This technique is intended for those who are more risk averse or just wrapping their heads around the value with these offers. Cashback/Bonus Bet up to $50 if your horse comes 2nd or 3rd. This is a very common promotion, most of the bookies have them each weekend. For the spring carnival, as you can see in the calendar, there are many to take advantage of. Step 1 - Find a race and a bookmaker where the promotion is available. Step 2 - Find a horse whose odds closely matches with the lay odds at Betfair using Matcha set to look for Qualifier. 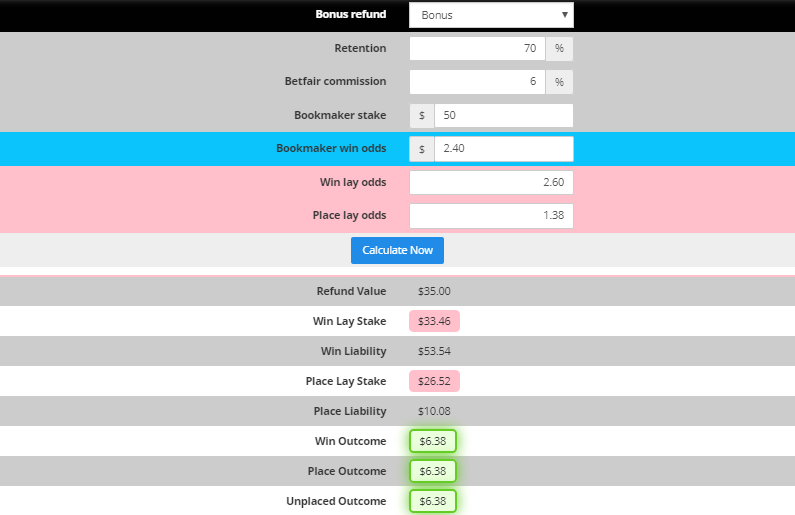 Step 3 - Enter the Bookmaker Back Odds, Betfair Win Lay Odds, Betfair Place Lay Odds, and Betfair commission into the calculator. Step 4 - Back the Horse with the Bookmaker. Step 5 - Lay the Horse on Betfair for both the Win and Place markets. Step 6 - Regardless of where your horse finishes, you'll have made money. The expected value of this method is slightly less than just laying the win market on Betfair. That's because laying the place market too, you are paying more commission to Betfair. The EV greatly dependent on the race. It tends to be higher on races with fewer runners. The EV Calculation is easy to see. As we're guaranteeing profit with this method, the EV is the same as the risk-free profit. A refund equal to your stake up to $50, if your fixed-odds win selection finishes 2nd/3rd. Refund applicable to your first bet on the race. This method whilst being risk-free is more difficult than just backing/laying the win market. Laying the Place market requires an extra bet to be placed on a market where the odds fluctuate fairly quickly. You'll also need to be using the lock-in calculator which means navigating away from the bookmaker page. Whereas if you're just backing/laying the win market, the Matcha allows you to get these bets on quickly. The place market for most events has fairly low liquidity until a couple of minutes before the race. The odds tend to fluctuate extremely quickly. 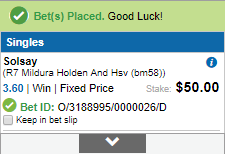 This method will work fine for most group races during Spring Carnival as the markets are liquid much earlier in the day. A late horse scratching can affect you in a couple of ways. Firstly if the bookie has changed the odds because of the scratching and Betfair hasn't it may appear that there are several good matches. Realistically you are unlikely to see more than one or two green matches at a time. If more are showing there may be a scratching. 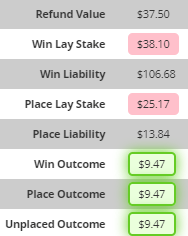 Also, a late scratching affects the payout returned for win and losses slightly differently on Betfair and bookmakers. This difference is only likely to affect your profit by a few dollars. Discuss this offer with members in our Facebook community here. Every Saturday you'll find several bookmakers offering this promotion. Not limited to the one day, Wednesdays and Sundays are proving popular too. You can search for these yourself by logging in and looking at the bookmakers' promotions page. Or alternatively, use the offer calendar. The next step is to find a horse lay odds on Betfair that closely matches the odds you can gain at the bookmaker. We would recommend keeping the settings to look for a qualifier. You can do this manually but a much simpler method is to use the Matcha to find a suitable bet for you. With Matcha you simply have to wait for a horse to turn green on the bookmakers page to know you have a suitable match. If using Matcha ensure you have the correct settings. You want to ensure 'Looking For' is set to 'Qualifier' this will enable you to find a suitable horse while also calculating for you a lay amount that will enable you to profit regardless of the result. Enter the Bookmaker Back Odds, Betfair Win Odds, Betfair Place Odds and Betfair Commission into the Calculator. At the current odds, you will lock in $9.47 profit. This is assuming you will obtain 75% of the value of your bonus refund on turnover. Back your selected horse at the bookmaker. We would recommend always placing your back bet before placing your lay bet. In our example, the best match as highlighted in green was on number 2 - Solsay. In this case, we were staking $50 with Sportsbet. The odds were 3.60. With the back bet placed you then want to place a lay bet on Betfair. Ensure you're not placing the lay stake as suggested on the Matcha. The calculation to lock in a profit is different from the regular qualifying back/lay. Ensure that you lay the win market first. The reason for this is it's more important to lay the win market is so that you don't leave yourself open to lose your entire stake. Use the stake as suggested in the 2nd/3rd Guarantee Calculator. Which with this example, is $38.10. Once you have layed the win market, open up the place market on Betfair. If the place odds have changed, ensure you adjust them in the calculator. The Place Lay stake for this example is $25.17. Regardless of where your horse finishes, you'll have made money thanks to locking in a profit against the refund. 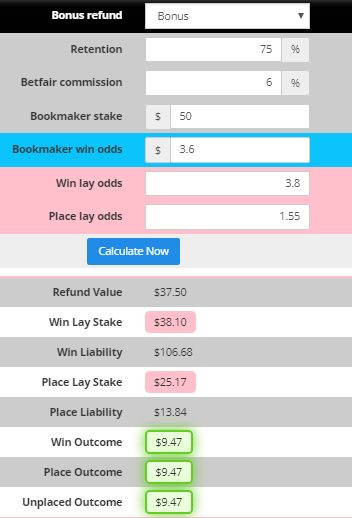 If the horse places, then you would have still profited as shown in the calculator, for the same amount $9.47. If the horse doesn't place, then you would have still profited as shown in the calculator, for the same amount $9.47. That's an ROI of 5.55% for a few minutes of your time. Take that one to the bank. If you want more help with this offer please join in the discussion in the community or jump on live chat to get someone on one support.